I love to stitch fall things and when I saw someone's finish of this JBW squirrel, I had to have him.....How did I miss him coming out? Frames by mail dot com is a good place to get frames to do it yourself(they don't lace/pin). I went and picked out(we have the company here to go to) the frames ordered them and then went and picked them up and did them myself. In the future I will go pick out, come home and order online then go pick up so I get a discount and build credit towards another discount(they are already less expensive than most other places). MBT Morning prayer in a cherrywood frame(outside edge is black) it really compliments the stitching when seen in person. This is the baby sampler that I delivered yesterday on her 1st month birthday. 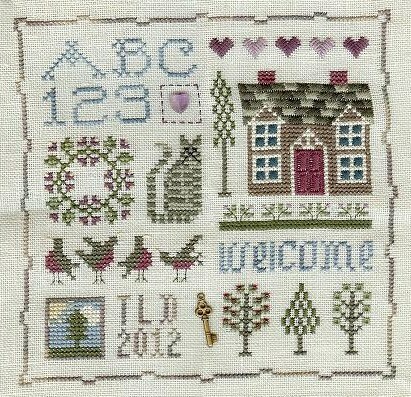 Welcome Spot Sampler that is by Drawn Thread. 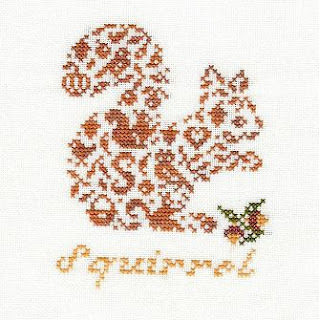 This was a quick fun stitch. I love samplers that you do one motif then move on to the next. This leaflet has been added to my sale album for $4.00 plus actual postage. I also have one of it with the charm pack included in the sale album too for $7 + postage. 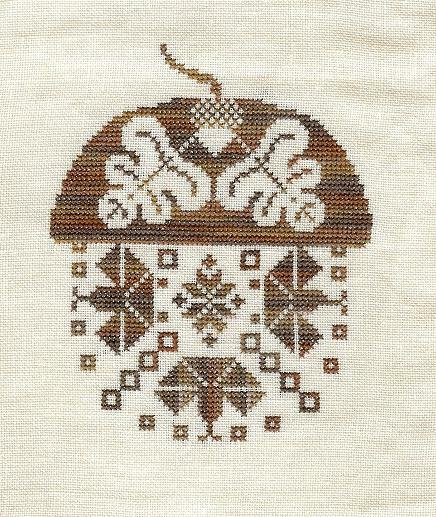 This is a freebie from Workbasket called Quaker Acorn. I used SNC Chocolate Caramel over 2 on 40 ct. Bittersweet(I think that's my new favorite fabric). The fabric actually has a tinge of pink that doesn't show in the photo. I've added some new sale items to my photobucket albums....I've put a couple here on my blog sale page too. I started this sampler well into the pregnancy of the recipient but thought I would be finished and just have to add the name and details when the baby was born. Well she arrived before I finished...I will pick out a frame today and hopefully get it to her before the baby is one month old in a week or so. This is from a 2008 issue of JCS. It is Vermillion ladybug baby sampler. I also have another finish but can't show it yet till it is received by it's recipient, as to when I don't know yet. The mother's day carrot etui and accessories was a hit and my talented mother did as I hoped and was able to finish the finishing on it to serve it's purpose as an etui. She was thrilled by it all and especially the scissors that she had unknowingly picked out to go along with it.